A few days ago I upgraded my home media player from the HMC-35HD made by Mele, a Chinese company, to the ASUS O!Play Air HDP-R3 to enjoy the many video formats supported by the HDP-R3. Before I resell the unit and earn back some cash, I am writing this short review which will hopefully help others who intend to purchase this player. Overall the unit is very light, with a dimension of 220x196x73mm and weight of 1096g (without HDD) (see full specs here). 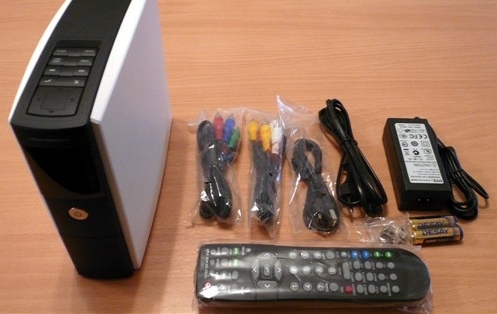 It seemingly offers a wide range of features, including playing of music and videos (AVI, WMV, FLV, etc), accessing shared folder via Samba and uPnP using Ethernet or Wifi, Internet radio and an NAS server. Storage devices can be connected via USB, or by inserting into the SD card slot. There are also 2 internal slots for 3.5″ SATA or IDE hard disk. When connected, the device can be used as an NAS server. Judging based on the physical design, it seems that only one hard disk, either SATA or IDE, can be connected at any time. USB Devices: open media files on devices connected via USB and on storage card inserted into the card reader. Enabled only if external storage devices are detected. Hard Disk: open media files from the internal HDD. Enabled only if a SATA/IDE HDD is connected. Ethernet: access Samba/uPnP shared folder on LAN. Enabled only if the device is connected via Ethernet and assigned an IP address. Wireless: access Samba/uPnP shared folder on wireless network. Enabled only if the device is connected to a wireless network and assigned an IP address. Internet Radio. Enabled only if the device has an IP address on the network. I could never get this to work. Upon selection, it will attempt to load for a while and will just say “unable to connect”. Video Output: you can set to Composite, VGA or Component. 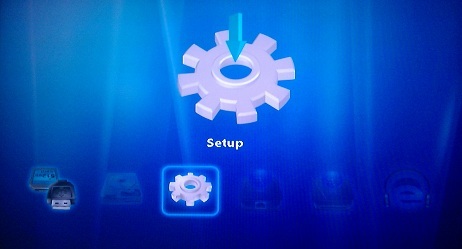 HDMI output is automatic and will be enabled only when the unit detects an HDMI monitor connected. To change the video output without opening Settings, press the TV-OUT button on the player or on the remote control a few times. Component: I could not get it to work with my TV. The TV will just flash the display from black to blue a few times and auto turn off. 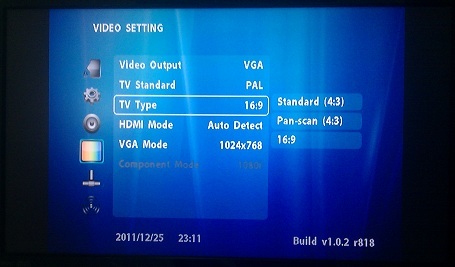 The setting is also grayed out unless a component cable is connected and video output is set to Component, making it difficult to change the settings to fit your TV if the TV does not like the default values. Composite: this works without much hassle. Just set the correct aspect ratio for your TV and you’re good to go. However, the maximum resolution is 480i, defeating the purposes of a high-definition media player. TV Standard: support either PAL or NTSC. Affect only composite output. PAL has slighter higher resolution than NTSC. 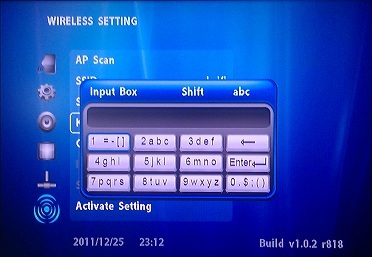 Modern TVs will handle both PAL/NTSC automatically so there is no need to change this setting. TV Type: Support either 4:3 or 16:9 aspect ratio. However, the settings screen will be wrongly scaled while videos still playback with correct aspect ratio, leaving black gap on the left/right as in the above picture, if 16:9 aspect ratio is selected when it has been selected previously. 16:10 is not supported. HDMI Mode: Set the HDMI resolution. Auto Detect is recommended. Notice that there may be HDMI handshaking failure, resulting in no output, if you’re using a HDMI-to-DVI converter to connect to a monitor with DVI only. See also my previous post. VGA Mode: Although VGA mode apparently only lists 640×480, 800×600, 1024×768 and 1280×1024, the resolution will be automatically adjusted to fit a 16:9 wide-screen monitor if the TV type is set to 16:9. VGA EDID is not used to identify the optimal resolution. Some TV may not show anything if the VGA resolution does not match its preferred resolution. To work around this, connect another LCD monitor and change the resolution. The player will always output audio via the RCA ports regardless of which video output mode is selected. This may be useful if you want to use a headphone. A RCA to 3.5mm cable is needed, obviously. There is also a bug here. If the wireless network is using 26 hexadecimal characters as the WEP key, the last hex character must be a digit (0-9) and cannot be between A-F or you won’t be able to enter it. I wish future firmwares will address this issue, but given how these Chinese companies work, I doubt there will ever be an update. The device has basic support for subtitles (.SRT and .SUB files). Subtitle will be automatically displayed if it has the same file name and is in the same folder as the movie; otherwise it can be selected manually. While English subtitle displays well, Unicode is not supported and font size can’t be changed. Word wrapping for subtitle is also not supported. I also tried accessing Samba and uPnP shared folders, which works. Take note that your shared folder must not be protected with a password. In Windows 7, Simple File Sharing has to be turned on, otherwise Windows will require the system password to access the shared folder. Unfortunately, NAS did not work in all my attempts. After installing the hard drive and pressing the NAS button on the remote control, the media player appeared to be in NAS mode but the shared folder is not accessible. Until this day, I do not know what the problem was. Despite some problems setting up and the fact that NAS does not work, I would still say that the HMC-35HD is worth considering, especially if you can get it second-hand. To be honest, I never expected a Chinese-made device to deliver all its promised features and therefore mainly use it as a media player. The only two things that irritated me were that most MKV files are not supported and that sometimes playback would stop half way and go back to the file list while showing “UNSUPPORT” on the screen. For this reason, I upgraded and the Asus HDP-R3 has served me well so far. The user guide for the player (in Chinese only) can be downloaded here.